All accommodation is decorated to a high standard and offers a high level of comfort.We are well placed for direct access from Pisa and Florence airports and also within easy access of Siena,Lucca,Pistoia and San Gimignano.We produce our own organic olive oil and wine and on your arrival you will be supplied with complimentary bottles of our wines and a server of our olive oil for you to try. We offer accommodation and a welcome at a price that others find it hard to compete with. We were so pleased with our choice of Casa Anita. From the moment we arrived, we were welcomed and we felt that sense of warmth from owners Chiara, Ian and Lisa until the day we left. The house is very comfortable with the most incredibly views of the valley and the village - sitting outside was a treat and we had to tear ourselves away from the view in order to visit the attractions seen from above! The kitchen is modern and easy to use with everything we needed. The rooms are spacious an comfortable. The house wine and olive oil were delicious and we enjoyed more than 1 bottle! As well it was unique to be able to walk thru the vineyards and olive groves that produced them. We loved the donkeys, goats and especially all the cats! Indiana Jones and Ariel were with us every day to make sure we were still welcome. We hope to come back in warm weather to experience that beautiful pool. The town of Vinci is quaint and easy to navigate, with shops and restaurants and the Piazza full of life. The Leonardo Museum is worth time spent there -- there is much to see and understand. We recommend getting the iPad tour. Access to Florence is a dream -- a 30 minute train into central Florence from Empoli which is no more than 15-20 minutes. Very very easy. Lucca is another great attraction as is the Medici Villa in Cerruti Guidi. The property is huge and has many smaller rentals tucked away it appears. Very quiet, gorgeous views and the smell of olive oil and basil in the air. Very quaint village walking distance and Leonardo's birthplace just up the hill. Great location and the goats and donkeys were a nice touch. Pool was clean but very cool good for hot days. You must buy the wine and olive oil from Chiara....they are superb. Only problem was sharing internet and trying to get online before anyone else. Chiara was helpful in providing a second connection password, but that rarely worked. If you don't need internet, everything else was wonderful, but my son and I were travelling on the 'fly' and had to look up future accommodation sites. Best of luck in the future with your lovely property!! 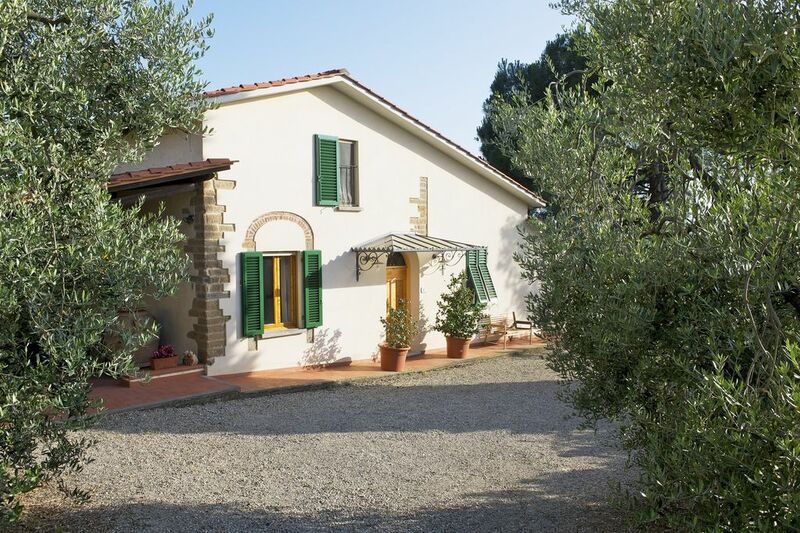 In 2006 my husband and me spent two wonderful weeks in podere zollaio, so we decided to spend next summer holidays there with our whole family(9 persons). Next to famous cities und wonderful landscape the farmhouse offers you private atmosphere. The service is brilliant and the property is very well maintained. You may combine a lazy time at the pool with culture, architecture and famous kitchen. First and foremost the museum and the Birth house of the great Leonardo in Vinci; the Medici villa in Cerreto Guidi, the Ceramic museum in Montelupo, the glass museum in Empoli and Certaldo, a beautiful medieval village birthplace of Boccaccio....but there is more! for the joy of your palate you can sample the local wine, the extra virgin olive oil and the famous S.Miniato truffles. Not forgetting that Florence, Lucca, Pisa, Pistoia, Siena, S.Gimignano and Volterra are all within easy reach either by car or by train (Florence, Pisa and Siena). During the winter months the heating will be calculated separately depending on consumption. Use of washing machine: Euro 3 per load. We ask our guests to provide the washing powder/liquid.